Hi there my lovelies! Happy Friday to everyone! 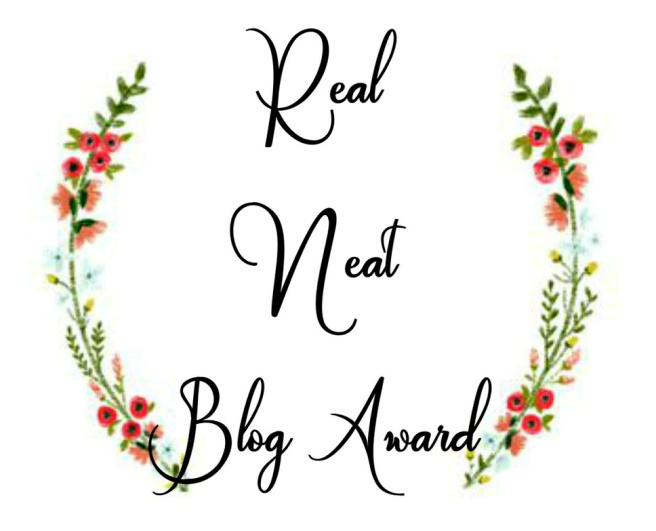 Today is extra special for me because I was privileged to get nominated by the Aricouture blog for the Real Neat Blog Award. I want to thank Aricouture from the bottom of my heart for this nomination. It means a lot to me. I have been blogging since end of October of 2014 with over six of break from blogging last month. 2. What’s something you like to start writing about on your blog? I always thought it will be cool to write once a month about one local unsung hero with collaboration with other bloggers. Especially I wanted to write about locals heroes who are inspiring others. 3. What is your hobby besides blogging? I used to paint. However, I also tend to doodle sometimes. I have allergic to pollen, shell finish, and raw spinach, arugula, and kale. 5. What’s been the most embarrassing thing that happened to you in your life? The most embarrassing thing has to be walking into a squeaky clean Super Market door and leaving my bloody nose print on the door. 6. Do you play sports? I don’t play sports but love watching American football games, especially NFL (National Football League) games. 7. Have you ever been outside the country and if so where have you traveled to? I have been to Dubai and it’s a beautiful city, home of the tallest building in the world. I really recommend anyone to visit the place if you ever get a chance. Below are my monies in no particular orders. Briefly describe how your blog got started. Who is your favorite real-life unsung super hero? What is one place in the world you always wanted to visit? If you could choose any profession in the world what would you choose and why? How would your friend and/or loved one describe you in one world. What is your alltime favorite movie. Hope you enjoy my posts and as much as I love writing them. Don’t forget to check out my Facebook Page and follow me on Instagram @allaboutme3181. Are you on Bloglovin? Let’s add each other. P follow me and comment below with your information so that I can follow you back. This entry was posted in Awards, Uncategorized and tagged blog, Blogger, Blogger Award, Lifestyle, Lifestyle blog, Real Neat Blogger Award by allaboutme31. Bookmark the permalink.